I needed a project. Something to do in the evenings instead of watching TV. I decided to build a new road bike from scratch. 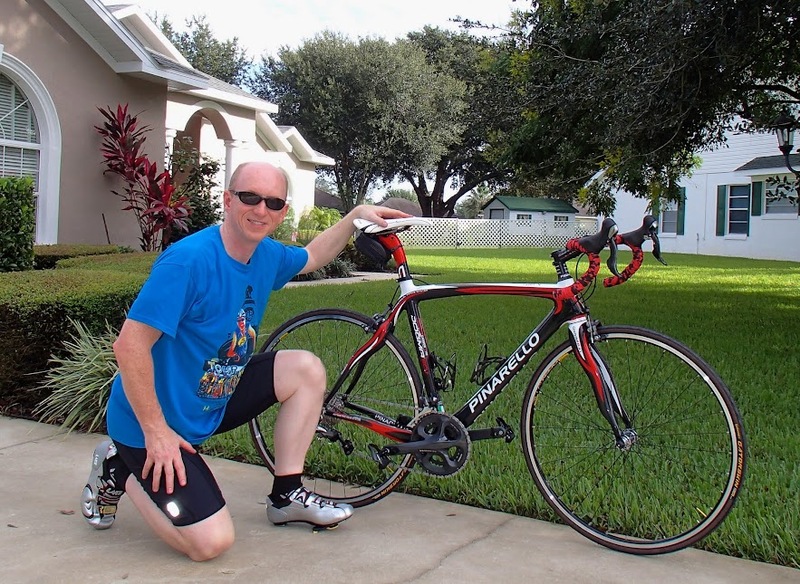 There's nothing wrong with my Cannondale Synapse 5. 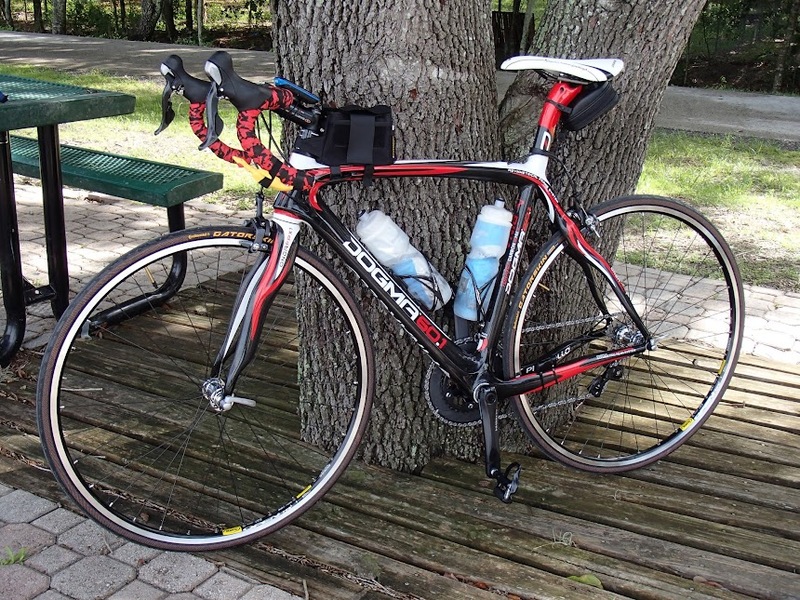 It's a great bike, very sturdy and very comfortable. This would be an additional bike... for entertainment purposes to see if I could build it. 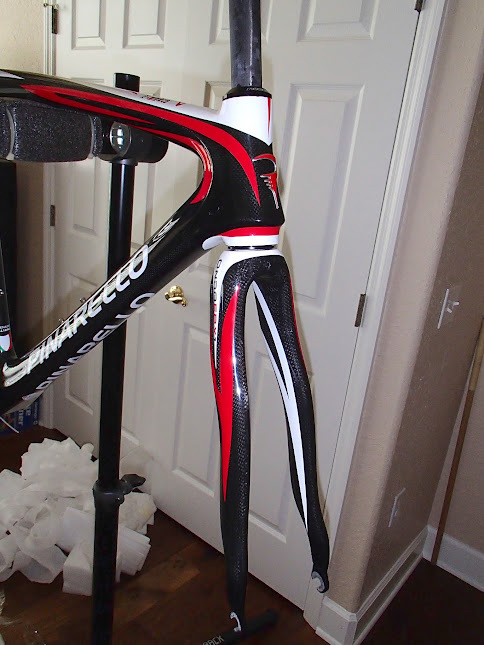 After a lot of research on the internet, I discovered almost all carbon fiber bike frames are manufactured in China or Taiwan and then imported. Laws being what they are, if 60% of a bike is assembled in a given country, it is allowed to carry a label that it was made in that country. Lots more research and comparison shopping... 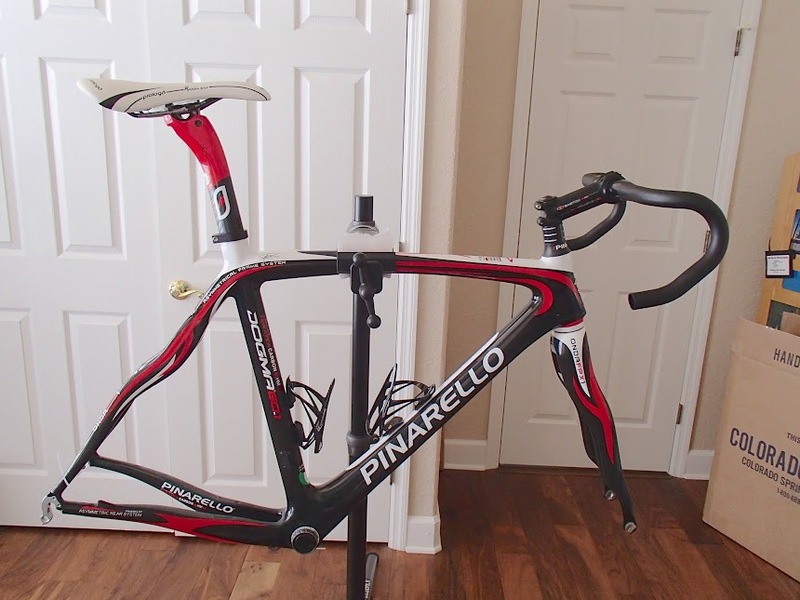 I finally settled on a Pinarello Dogma2 carbon fiber frame**. I liked the styling, the color scheme, and the reputation of the seller. I ordered it direct from China. They had my size (54cm) in stock and the shipping took less than two weeks. But that's just the frame, seat post, front fork and headset. I still needed all of the components, like a seat, handlebars, pedals, etc. I did a lot of comparison shopping over the internet and then someone on an internet forum referred me to Colorado Cyclist. 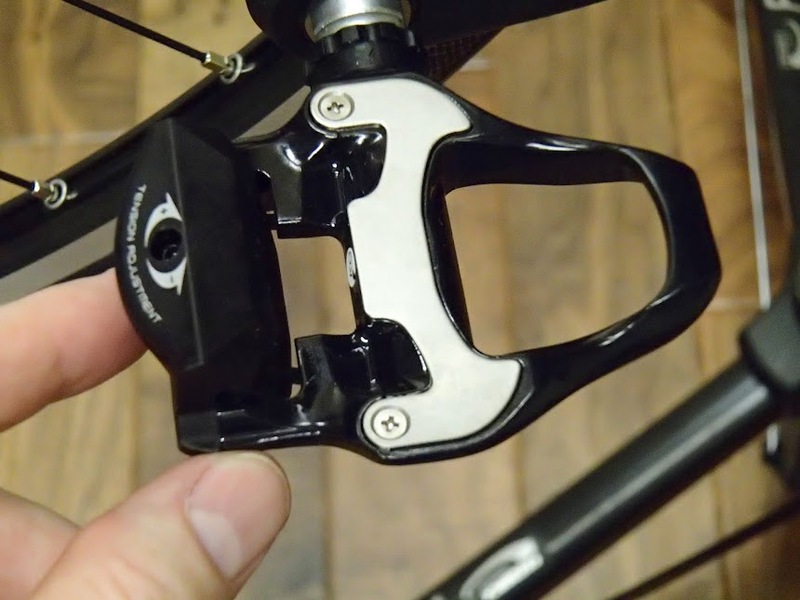 They have customizable packages of components that literally include everything except the pedals. 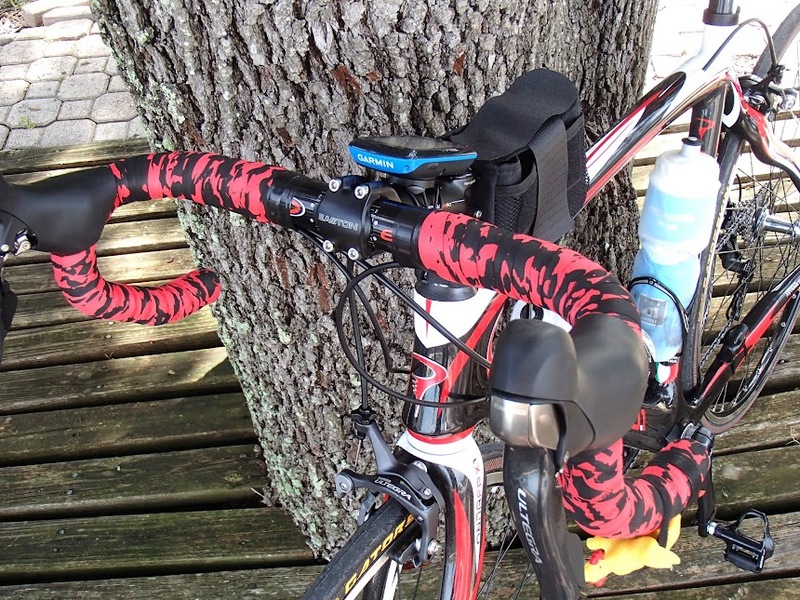 Even cables and handlebar tape are included. I settled on the SSFBASG1 package that consisted of all Shimano Ultegra 6700 components, Mavic Open Pro wheels, and your choice of seats, tires, etc. The entire package is several hundred dollars cheaper than if I purchased the same or similar parts separately. They custom-built the wheels and shipped the entire set to me. Now it's up to me to carefully put it all together! Trust me, I'm spending a lot of time looking at YouTube videos for guidance. 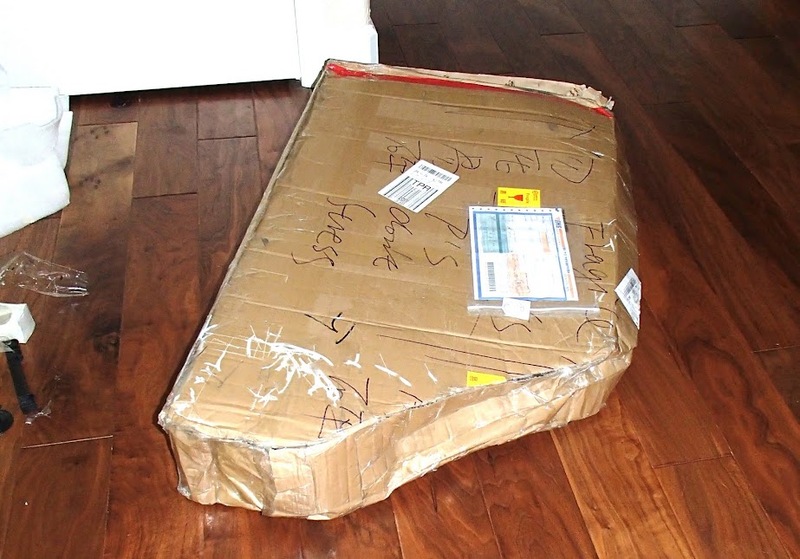 ...but the shipper used plenty of quality foam to pad the frame and it arrived in perfect condition. 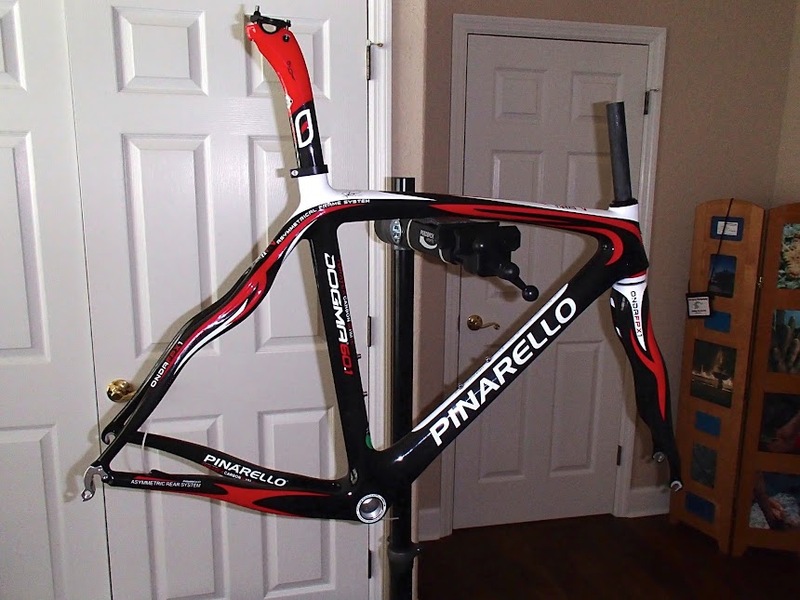 My new Pinarello carbon fiber frame with internal cable routing. 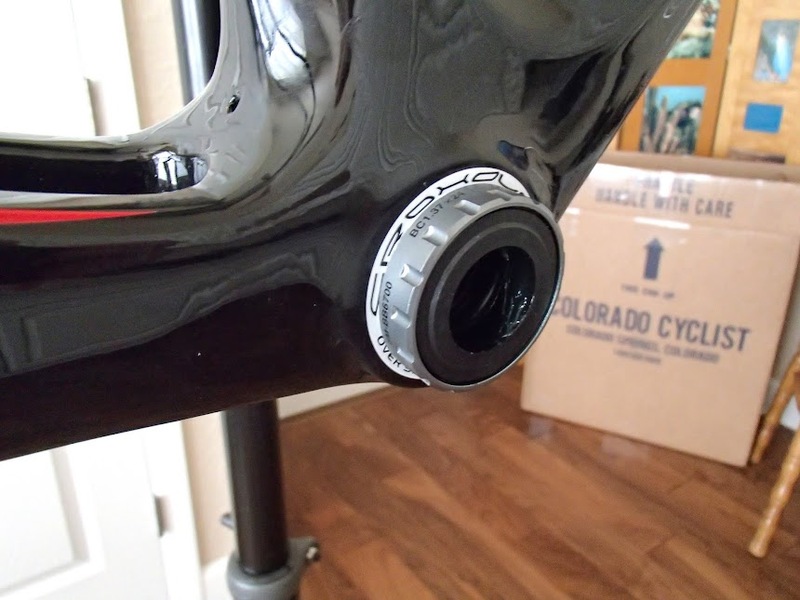 In this shot, I have already installed the areo seat post, fork, and the headset bearings. 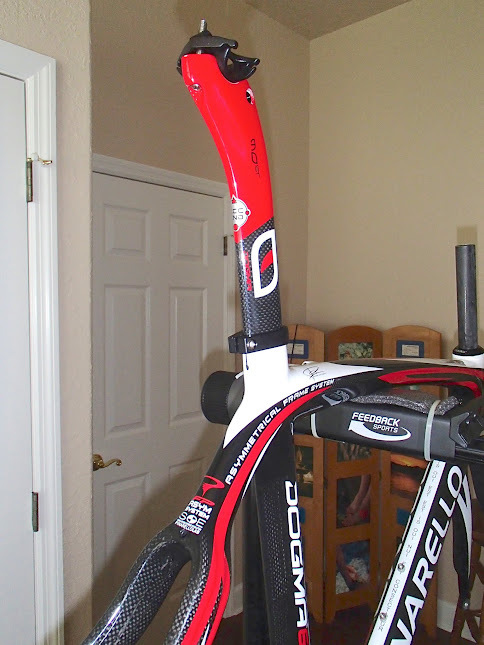 A front view of the fork and frame. It appears to be very high-quality carbon fiber. The chain stays, derailleaur mounts, and bottom bracket housing. The components arrived today! The large box holds only the wheels. The smaller box contained everything else and it was carefully packed. 9-12-2012. The bottom bracket housing in the frame. This is where the shaft goes through that connects both pedals. The 68mm English bottom bracket cup and bearings. This comes apart and each end is screwed into the bottom bracket housing. The bearings are inside the large ends. The threads didn't want to screw into the threaded housing. At the syggestion of the parts dealer, I took it all over to a local bike shop, Bent's in Lakeland. They said it is common for a new frame to have the bottom bracket threads a little buggered up. 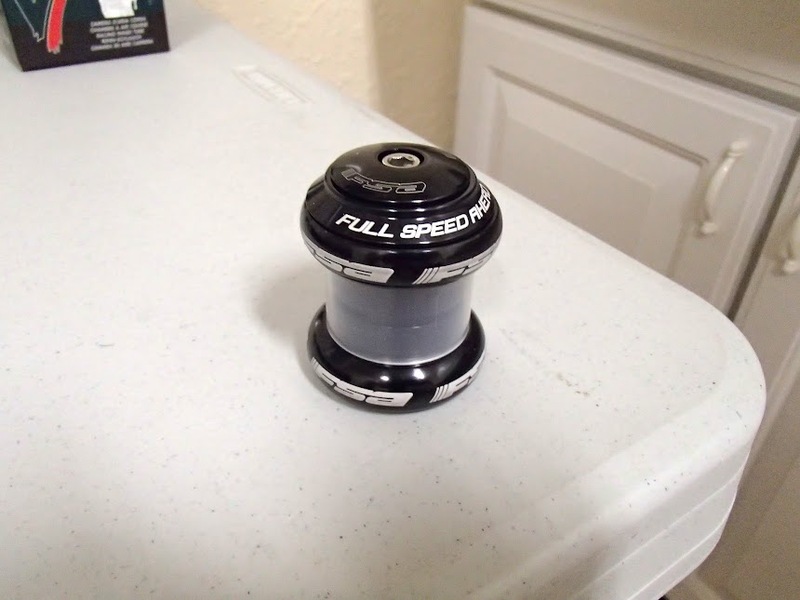 They will run a thread tool through it to straighten them out and then install the bottom bracket for me. 9-13-2012. The rim tape has been applied. 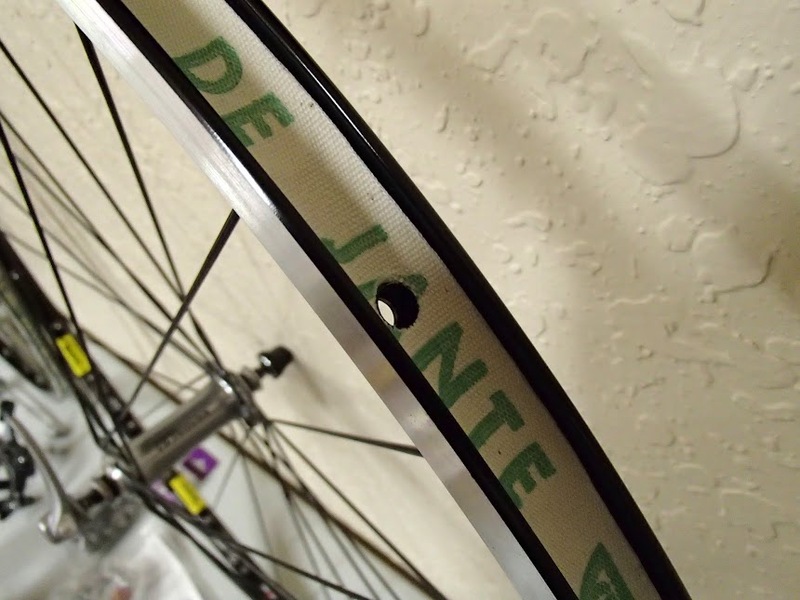 This cushions the tube against the rough edges of the spoke ends. The headset that came with the kit turned out to be unnecessary since the frame and fork came with a headset. Not really sure what I'm going to do with this one. Maybe sell it on eBay. 9-15-2012. Bent's bike shop was able to straighten out the threads. The bottom bracket is now installed. Almost everything else was pending this step. 9-16-2012. Take a look at earlier photos and you will notice the factory steerer tube, the long tube that goes through the front of the frame and connects to the front fork, is made really long. That's so it can be customized for each bike. Today, I cut it to the correct length, reinserted it through the frame, added the tapered 'Pinarello' spacer and the three 'Douglas' spacers that came in the parts kit. 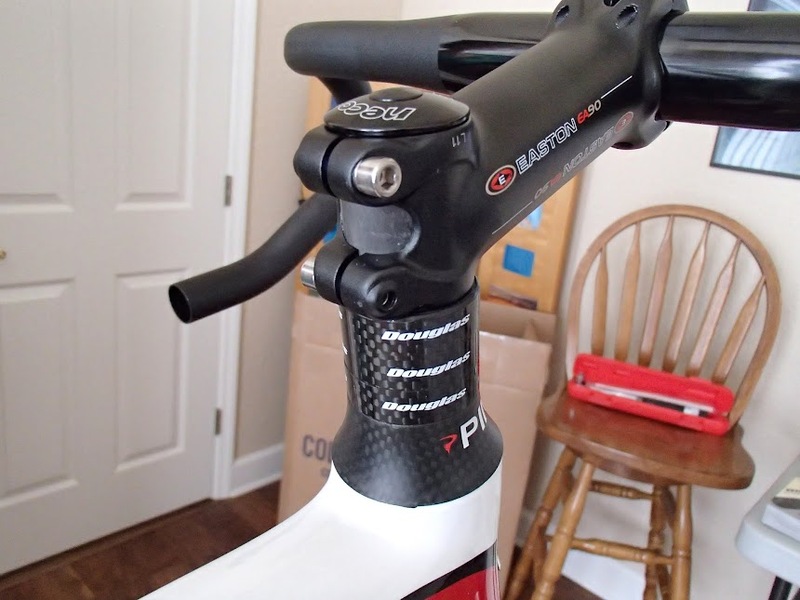 On top of that, is the stem, the part that extends forward and the handlebars are mounted to. Topping it off is what's called the compression plug (upside down it has NECO printed on it). This compresses and holds the whole batch together. If you look closely at the three Douglas spacers just below the stem, the top one had a sharp edge on it and I didn't think it looked all that good. So, I broke out the Dremel tool, rounded off that edge to make it blend a little better with the bottom side of the stem, and then touched it up with some black paint. Turned out okay. It's starting to look like a bike. Next up: The chain rings (front gears) and crank arms (what the pedals mount to). 9-17-2012. Tonight I mounted the chain ring set (the gears up front) and the pedals. This is the right side. This is a 50/34 chain set. I opted for Shimano 105 pedals. 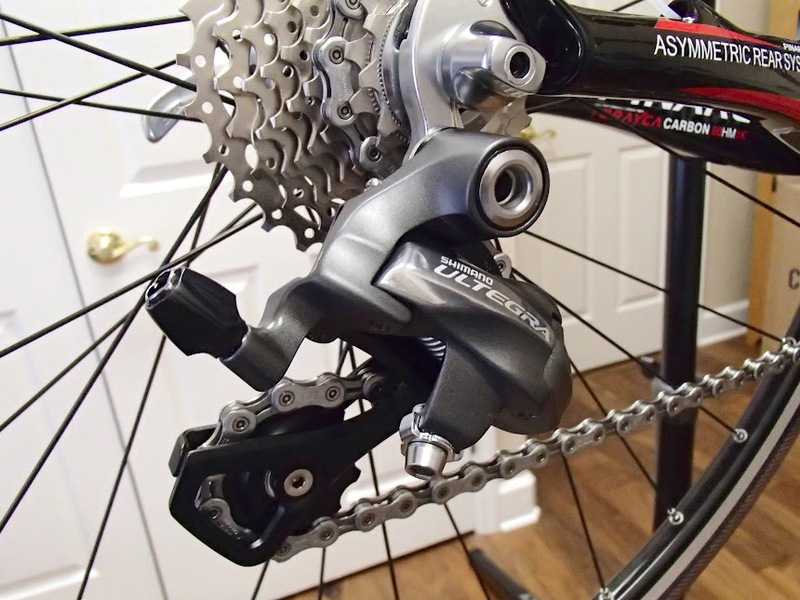 A little heavier than the Ultegra pedal but very reasonably priced and they match the ones I have on my other bike. Cleats for one will work on the other. 9-18-2012. 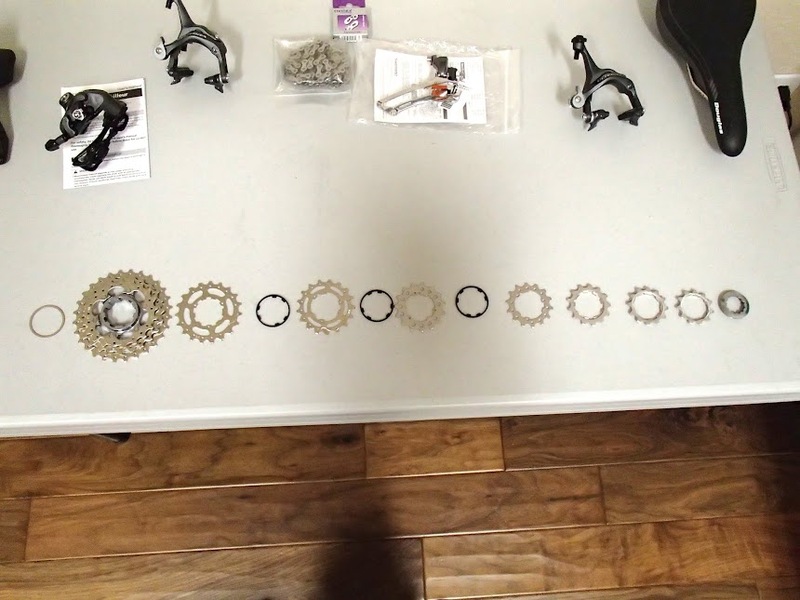 The cassette gears and spacers, laid out in order of installation. These comprise the rear gears. 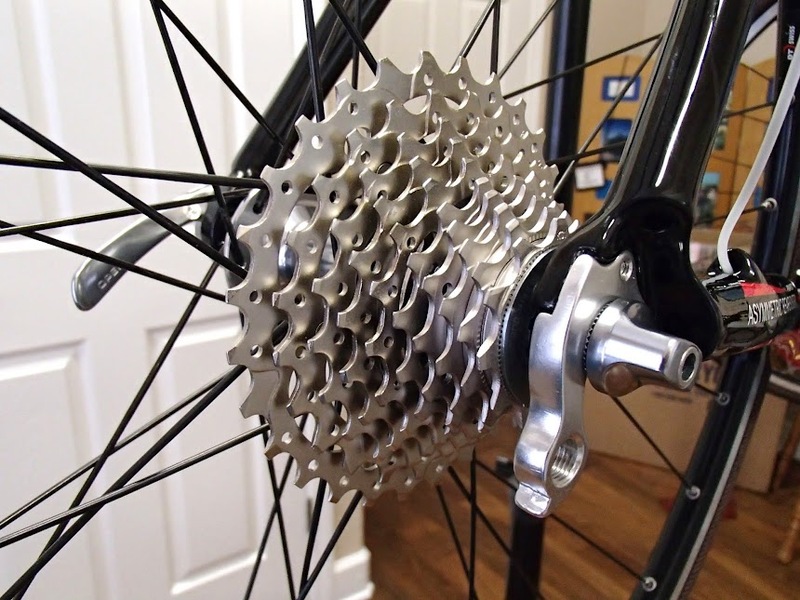 The gears are an 11-28 set, meaning 11 teeth on the smallest gear and 28 teeth on the largest. The cassette or rear gears installed. Tomorrow night: Installing the derailleurs, the part that does the actual shifting. 9-19-2012. Front derailleur, installed. The cables haven't been installed and the limit screws haven't been adjusted. That will come later. Rear derailleur, installed. The cables haven't been installed and the limit screws haven't been adjusted. That will come later. 9-20-2012. The rear brake caliper is installed. The front brake caliper is installed. 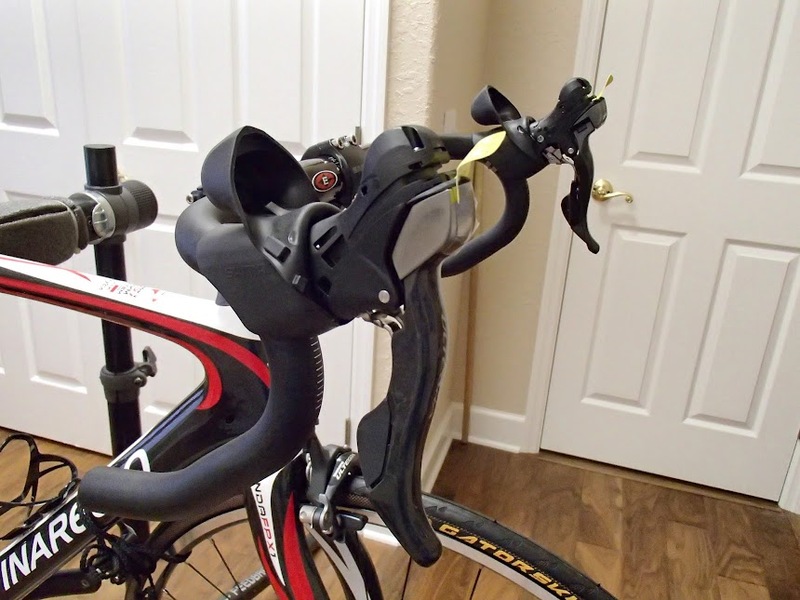 The combination brake/shift levers are installed. Tomorrow night: Start running and adjusting the four cables. Took it out for a short spin to see how it was shifting and stuff. A little over 40 miles later, I returned home. Just needs a little tweaking on the handlebar position and a cleat adjustment. This has been a great experience! I really learned a lot about how a bike is put together and what makes it work. 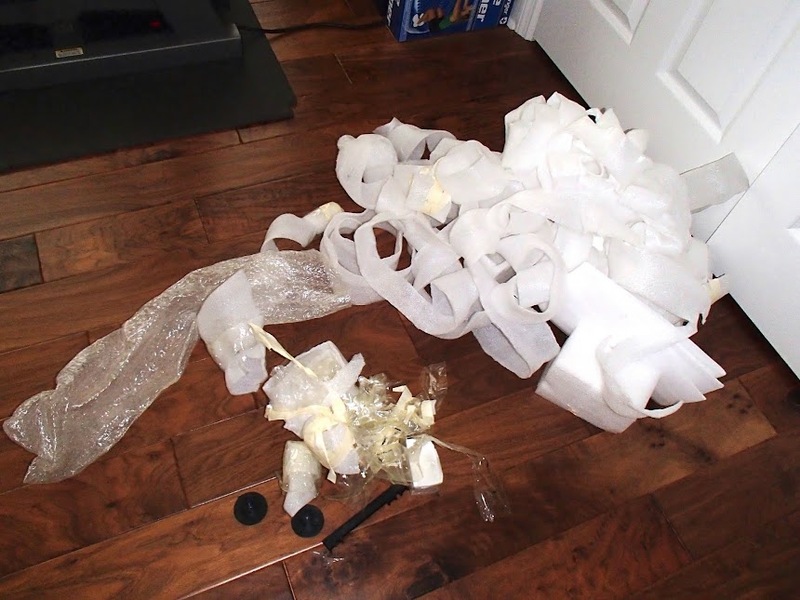 One of the biggest surprises was that it looked like a lot of parts but turned out to go together quite quickly, even though I was definitely not hurrying. Each night I did a little bit of work but it honestly took more time to take the photos and upload them than it did to do any of the work. All things considered, I wouldn't hesitate to do this again and probably wouldn't do anything differently. It all worked out pretty well. Initial Observations from the first road test: The carbon fiber frame is stiffer than my Cannondale's aluminum frame. 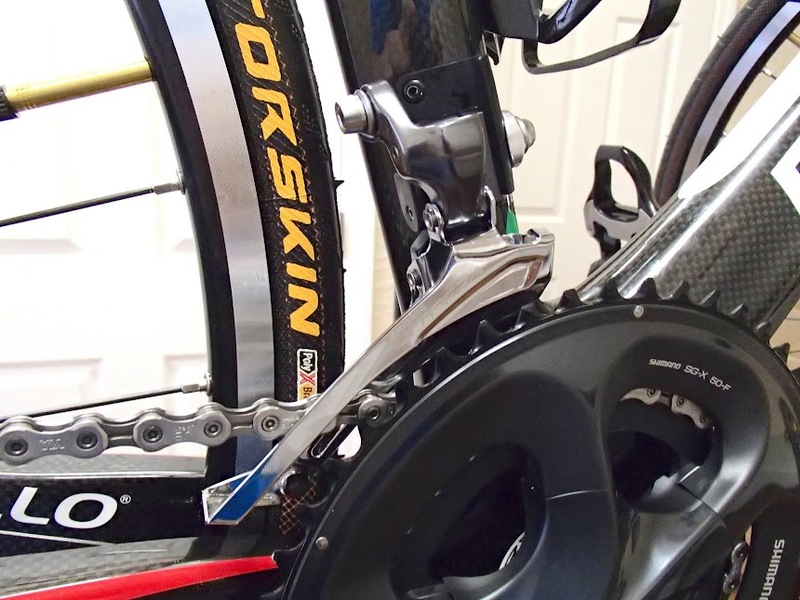 It's most noticeable when standing up to really put some power in the pedals. 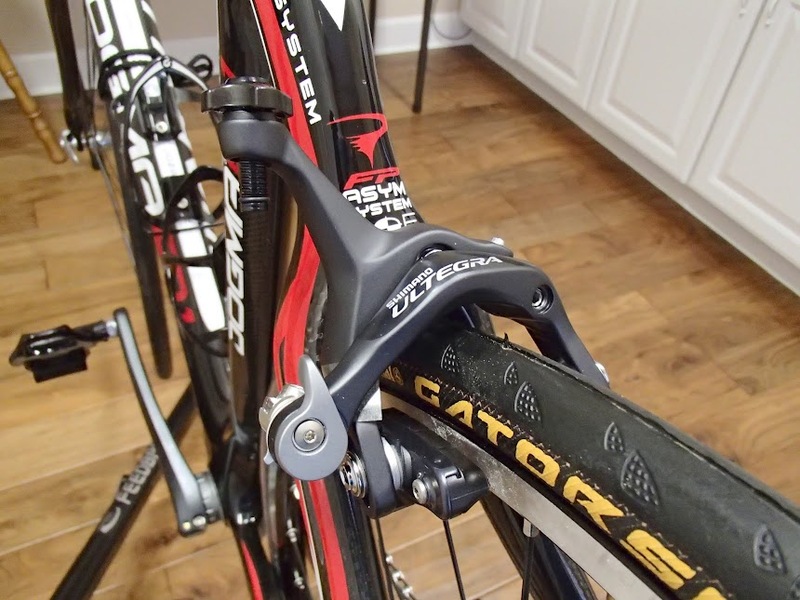 During the first ride, I took it down a road that is paved with composite material. It's generally not fun to ride on but not bad enough to avoid it. The carbon fiber frame did an excellent job of absorbing the vibrations from the road. 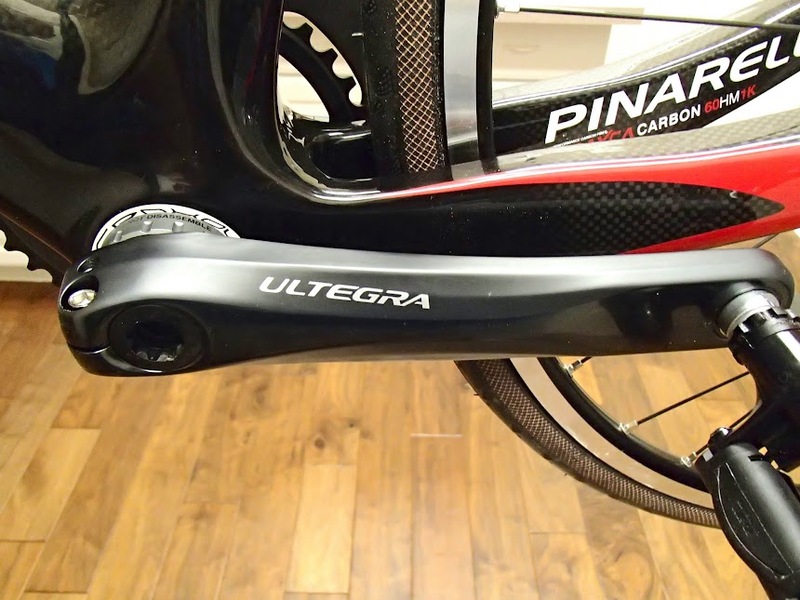 The Ultegra shifters seem to have a slighter shorter, faster throw than the 105s on my Cannondale. I liked that. 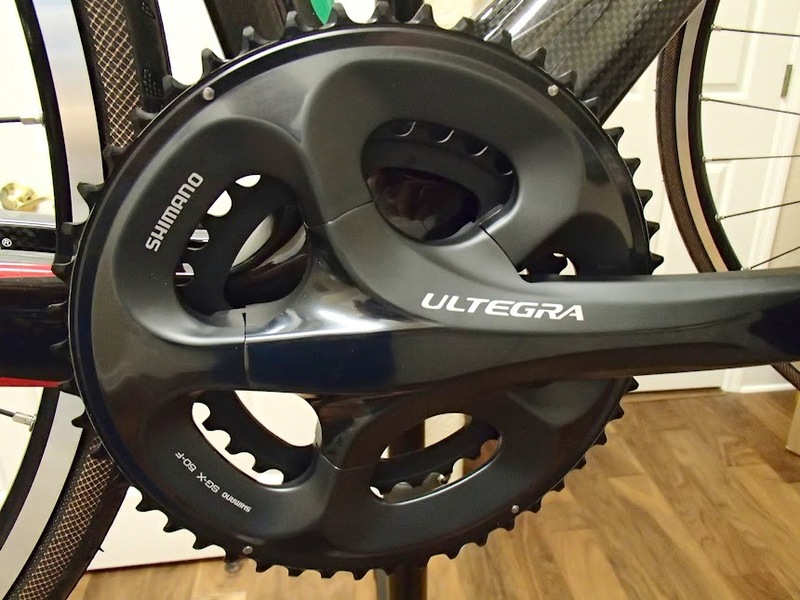 The Ultegra gears, shifters, and brakes all performed flawlessly. I'm quite pleased with the outcome! 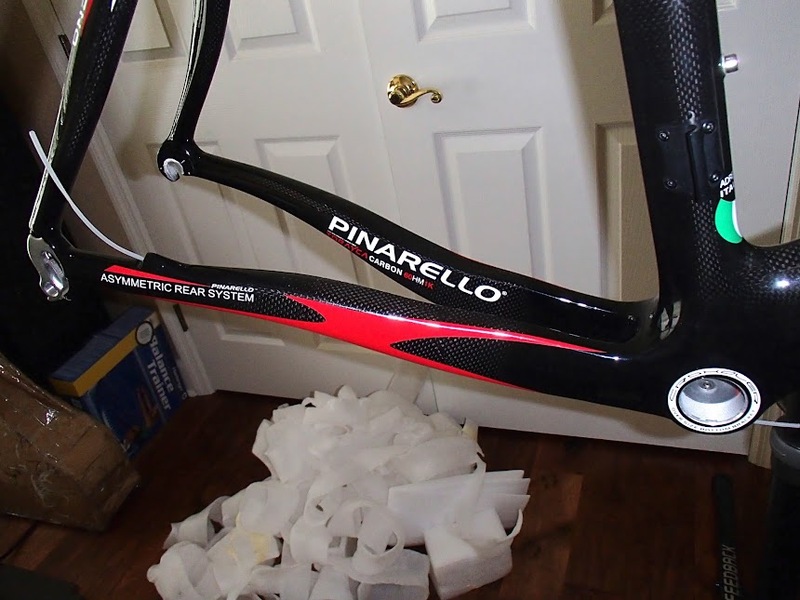 **EDITED - One reader pointed out that a frame from the Pinarello Company in Italy would come with an Italian bottom bracket and since this frame came with an English bottom bracket, it was obviously a knock off. I'm sure he's right. This probably is a knock off frame. However, it's of high quality construction with great detail paid to the fit and finish of the final product. I'm quite happy with it. 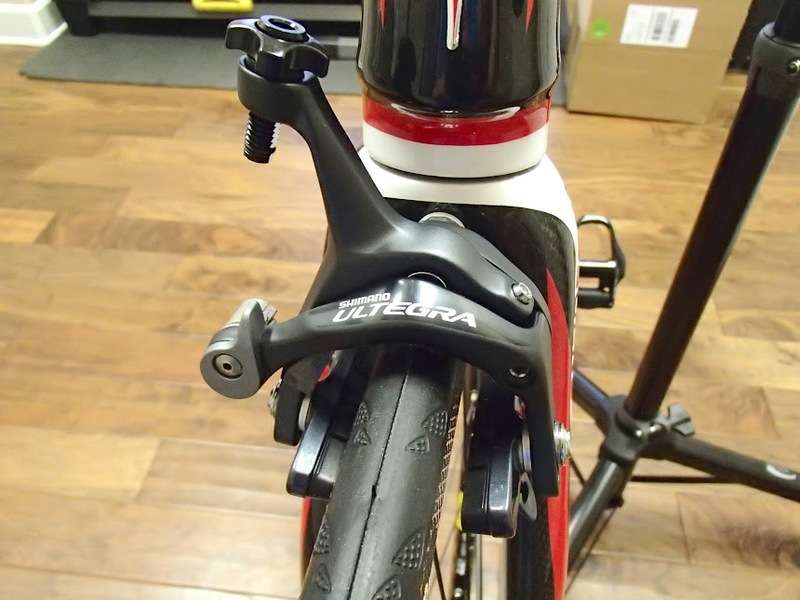 A long-time bike shop employee recently spent two and a half hours with this bike during a professional fitting and he couldn't tell the difference. Several employees and customers remarked on it and one customer tried to buy it. It looks great, rides like a dream, and I'm very happy with it.